A mailbox post is a pretty simple structure. You need a vertical post to go in the ground and a horizontal piece to support the mailbox. The way you join them can make the structure both sturdy and attractive. Using a circular saw, cut lines half the thickness of the 4×4 post and exactly the width of the post at the point where the vertical post where the horizontal piece will cross it. Make cuts every eighth inch or so in between those lines. Chip out the remaining wood by tapping with a hammer. Repeat this process on the horizontal piece. Fit the two notches into each other at a perfect 90-degree angle. Use a few deck screws to keep them in place. Although not necessary, you can add a diagonal support under the side that will support the mailbox. Finally, cut a piece of three-quarter-inch thick dimensional lumber to fit into the recess under the mailbox. This will make it easier to attach the box itself to your sturdy new mailbox post. 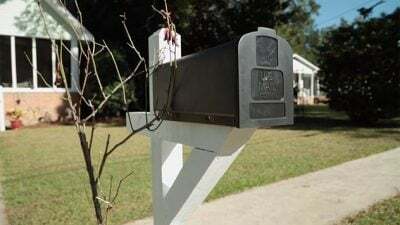 What Are the Requirements for a Curbside Mailbox? If using pressure treated wood wear gloves. And if cutting it, a dust mask… per the manufacturers directions. Pressure treated wood no longer contains arsenic (especially don’t burn the old stuff), but the chemicals in the new stuff are still hazardous in the concentrations used. Stay safe and enjoy the fruits of your labor. Don’t forget to wear gloves if you’re handling pressure treated wood. While the new pressure treated wood no longer contains arsenic (which is still something to think about when you dispose of that old pressure treated wood… Don’t burn it! ), it still contains chemicals that can be absorbed through your skin. Also, wear a dust mask when cutting or sanding it. Thanks for this. I recently upgraded my driveway and I accidently broke my old mailbox! So I need a new one, I looked online and the prices are far too much for what they actually are. So I think I will make one. Thanks for sharing this.